New England Expected To Bear The Brunt Of Nor'easter : The Two-Way Forecasters had predicted the storm could bring 1 to 3 feet of snow and hurricane-force winds. But early Tuesday morning, the National Weather Service downgraded some of the numbers. Along the East Coast, people are waiting to see what Mother Nature unleashes. Forecasters had predicted the storm could bring 1 to 3 feet of snow and hurricane-force winds. But early Tuesday morning, the National Weather Service downgraded some of the numbers. It says New England will get slammed the hardest but not as badly as had been expected. Snow falls around the Empire State Building in midtown Manhattan. From New Jersey to Maine, residents are under blizzard warnings Monday night as the National Weather Service warns millions of people about a "high-impact winter storm" that would likely bring "crippling snowfall" and "life-threatening blizzard conditions." Monday afternoon, governors, mayors and other officials declared emergencies in the storm's path, and urged people to stay indoors for their own safety. Gov. Charlie Baker issued a travel ban for the state of Massachusetts, starting at midnight. A similar ban was issued in Connecticut. Classes at many schools were canceled pre-emptively, and grocery stores were running out of supplies in some areas. In addition to the snow and cold, low visibility and winds in the 50-mph range are expected. "These winds will create huge waves 26-31 feet high along the east coast of Cape Cod," Weather Underground reports, "and 7-13 feet high along more sheltered parts of the coast." As is the case with big weather events, this one has a name — or more than one. The Weather Channel calls it Winter Storm Juno; people on Twitter prefer either #Snowmageddon2015 or #blizzardof2015. And as you'd expect, some people were less than serious in posting about the impending blizzard. 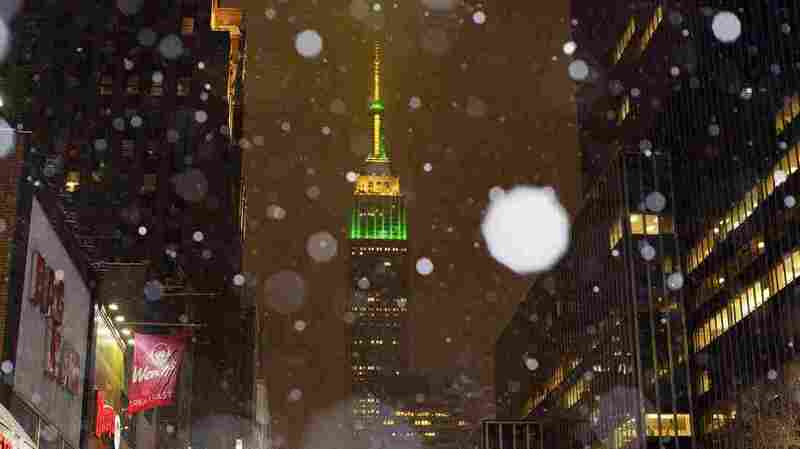 In areas such as New York City, the worst of the snow is expected to hit sometime after midnight; the city's transit and taxi systems will close at 11 p.m, WNYC reports. The next time the city will have less than a 50 percent chance of snow won't come until 3 p.m. ET Tuesday. In Boston, "Snow will become heavy with accumulation rates of 1 to 3 inches per hour late tonight and early Tuesday morning," WBUR reports, noting that residents could see 3 feet of snow tomorrow. In Maine, those who can't stay off the roads should "be prepared, and keep blankets, a fully charged cell phone and emergency provisions in the car," the Maine Public Broadcasting Network reports, citing Lynette Miller of the state's Emergency Management Agency. The network passed along a message from state officials: "Be prepared for a challenging 36 hours and we're not kidding." The New York Stock Exchange just sent word: "We will be open for normal trading hours tomorrow."